Registered nurses play a vital role in helping people through injury and illness, often spending a great deal of time with patients while providing care. To become a nurse, you must have both medical knowledge and the interpersonal skills to work with patients, physicians, and fellow nurses. An online BSN program can launch your nursing career in two ways. Your program prepares you for licensure, which all states require registered nurses to obtain. Also, earning a bachelor's degree puts you at an advantage over new registered nurses with only an associate degree, as many schools offer online accelerated BSN programs that take just a few months to complete. The Bureau of Labor Statistics projects that the nursing field will grow 15% between 2016 and 2026, more than double the projected average growth rate for all professions. With nurses in high demand across the country, now is the perfect time to take a look at an online BSN program. In the classroom, nurses learn many of the same subjects as students earning their M.D. Foundational courses include chemistry, biology, psychology, and anatomy. These courses generally include lab time, which may require you to travel to campus on a weekly basis. Core nursing courses ask you to study best practices related to providing care and showing leadership in the medical profession. Depending on your BSN online program, you may have the option to choose a specialization. To help care for the nation's aging population, many nurses specialize in geriatrics. After graduation, these nurses work in physical therapy centers, nursing homes, and hospice centers. If you prefer to work with children, you may consider specializing in pediatrics. Nursing programs often require students to complete an internship. During your internship, you learn from practicing registered nurses, working alongside them as they treat patients. A successful internship may lead to letters of recommendation, helping you find your first job after graduation. Texas A&M University ranks #1 on The 50 Best Online Bachelor's in Nursing Programs! Texas A&M University offers an RN to BSN program through which registered nurses can earn a bachelor's degree online. The program is designed for working nurses who earned RN licensure through diploma, paramedic bridge, or ADN programs. After meeting core academic requirements, students can choose a one-year, an 18-month, or a two-year core nursing program track. Each track requires a 30-hour curriculum that builds on fundamental nursing knowledge. Students in the online BSN program gain professional training and learn skills related to evidence-based decision making, nursing informatics, pharmacology, and community health issues. Core courses provide leadership training and explore professional practice issues. Distance learners complete a supervised practicum in a local healthcare facility. Applicants to the online BSN program must have completed at least 40 credit hours of general education prerequisites, including 12 hours of coursework in mathematics and the natural sciences. Competitive applicants have a GPA of at least 3.0. Texas A&M University is regionally accredited by the Southern Association of Colleges and Schools Commission on Colleges (SACS). The nursing college is accredited by the Commission on Collegiate Nursing Education. University of Central Florida ranks #2 on The 50 Best Online Bachelor's in Nursing Programs! UCF's online RN to BSN program allows state-licensed nurses who hold associate degrees to earn a BSN while working full time. The 30-hour core curriculum prepares nurses for career advancement and leadership roles. Students explore topics including pharmacology, information management, pathophysiology, and evidence-based practice. The program concludes with a public health practicum in the distance learner's community. Applicants who earned their associate degree outside the Florida public university system must submit transcripts for evaluation; students can apply up to 29 approved prior learning credit hours toward the online BSN program's 30-hour core requirement. BSN students can substitute up to nine credit hours of online coursework that also meets requirements for UCF's graduate nursing programs. Full-time students typically complete UCF's online accelerated BSN program in three semesters, and most part-time students require 10 semesters. Distance learners receive discounted tuition rates and fee waivers for campus-based activities. UCF offers several privately endowed scholarships to eligible nursing students. University of Central Florida is regionally accredited by the Southern Association of Colleges and Schools Commission on Colleges (SACS). The nursing program is accredited by the Commission on Collegiate Nursing Education. George Washington University ranks #3 on The 50 Best Online Bachelor's in Nursing Programs! Registered nurses who pursue GW's online RN-BSN program complete all requirements entirely online. The part-time, four-semester program leads to increased career mobility and marketability. The 21-credit online BSN program emphasizes high-level nursing skills and provides knowledge in areas such as population health, healthcare finance, medical informatics and technology, and public health nursing. Coursework focuses on the practical application of evidence-based nursing practice and leadership skills. The program culminates in the development of a professional portfolio; there is no practical experience requirement. GW's nursing school offers fixed-rate tuition for nearly all programs, and the university's partnership with George Washington Hospital leads to job opportunities. Nursing students have access to scholarships, and the Nursing Scholars Program offers complete tuition reimbursement in exchange for a service commitment. The ideal applicant has an associate degree in nursing from an accredited school, has at least a 3.0 GPA, holds active state licensure, and is employed. RNs in the DC area who meet certain criteria are guaranteed admission. GW is regionally accredited by the Middle States Commission on Higher Education (MSCHE). The nursing program is accredited by the Commission on Collegiate Nursing Education. Appalachian State University ranks #4 on The 50 Best Online Bachelor's in Nursing Programs! Appalachian offers one of the most flexible BSN online programs available to RNs with an associate degree. The RN to BSN degree completion program comprises fully online coursework with no traditional clinical requirements. Appalachian awards prior learning credits for work experience. The program prepares students for careers as generalists in the nursing profession. Appalachian's 124-hour, part-time program is designed for working nurses with an associate degree or diploma in nursing. The curriculum may be adapted for students who hold bachelor's degrees in other academic disciplines. The nursing core emphasizes professional skills development and advanced care delivery. Students master nursing informatics, assessments, current research, and leadership skills. Graduates are equipped to deliver professional care within communities and to older adults. Rather than clinical assignments, the program requires class projects. Lower-division prerequisites comprise a 44-hour university core, 18 hours of nursing cognate courses, and elective classes. Before beginning upper-division coursework, students join cohorts of peers with whom they complete nursing major studies. At the end of the first semester of upper-division study, Appalachian grants each student 30 credit hours for prior learning experiences and clinical competencies. Students generally spend three semesters with their cohorts. Appalachian State University is regionally accredited by the Southern Association of Colleges and Schools Commission on Colleges (SACS). The nursing program is accredited by the Commission on Collegiate Nursing Education. University of Alabama ranks #5 on The 50 Best Online Bachelor's in Nursing Programs! UA offers two online BSN programs for licensed nurses who hold associate degrees or hospital diplomas: an RN to BSN program and an RN to MSN program. Both programs are available fully online, and students arrange to complete clinical experience requirements locally. Students who have completed UA's university core requirements can earn the RN to BSN program with six upper-division nursing courses. The 25-hour core curriculum is based on fundamental nursing knowledge. Courses explore topics including medical informatics, inquiry, evidence-based practice, and client systems. The RN to MSN track allows nurses with an associate degree or diploma to concentrate in clinical nurse leadership or case management. The expanded 50-hour core curriculum prepares students for advanced professional roles. Applicants must hold a two year degree from a program approved by the Accreditation Commission for Education in Nursing. UA offers scholarships specifically for online students. The University of Alabama regionally accredited by the Southern Association of Colleges and Schools Commission on Colleges (SACS). The nursing program is accredited by the Commission on Collegiate Nursing Education. Allen College ranks #6 on The 50 Best Online Bachelor's in Nursing Programs! Based in Waterloo, Iowa, Allen College is a private institution that focuses solely on healthcare education. The college's affiliation with Iowa's healthcare system attracts distinguished faculty members and often leads to employment opportunities for graduates. Allen College's RN to BSN program is an online degree completion program designed for Iowa RNs. Allen College grants 40 hours of prior learning credit for RN licensure. The core curriculum provides professional knowledge and proficiency in evidence-based practice, community health nursing, healthcare communications, informatics, and public health policy. Students explore leadership skills in a clinical environment, and the program culminates in a practicum within students' local communities. The 124-hour program builds on a general education in the arts and sciences. Applicants must have completed 54 hours of general education coursework at another regionally accredited institution. Students in the BSN online program may challenge two courses per year by passing a challenge exam and submitting a portfolio of relevant clinical experience. Not all courses are eligible for challenge. Students can complete the program on a full-time or part-time basis. Allen College is regionally accredited by the Higher Learning Commission (HLC). The nursing program is accredited by the Commission on Collegiate Nursing Education. Clemson University ranks #7 on The 50 Best Online Bachelor's in Nursing Programs! Clemson offers one of the best online accelerated BSN programs available. The RN to BS completion program allows motivated RNs to complete their BSN in one year. The program includes no clinical practice requirements, but students must attend a two-day orientation on campus. Clemson's 32-hour program emphasizes professional skills development. Graduates are versed in management, leadership, current nursing research, and scientific communication. The program explores nursing specialty topics such as advanced pathophysiology, health assessments, and community nursing. Students complete two courses in healthcare genetics. Students receive 31 hours of credit from their ADN programs. Students can complete the RN to BS program on a part-time or full-time basis, and Clemson delivers all online courses asynchronously. Clemson's nursing school boasts a student graduation rate of nearly 100% after three months and is a designated National League for Nursing Center of Excellence in Nursing Education. Nurses who hold an associate degree from a nationally accredited nursing program, are currently licensed in their home state, and have a 2.75 GPA can complete the upper-division nursing program entirely online. Clemson University is regionally accredited by the Southern Association of Colleges and Schools Commission on Colleges (SACS). The nursing program is accredited by the Commission on Collegiate Nursing Education. East Carolina University ranks #8 on The 50 Best Online Bachelor's in Nursing Programs! ECU's online BSN program is designed for nurses who hold licensure in North Carolina or an Enhanced Nursing Licensure Compact state. The RN to BSN program focuses on professional skills development. Students gain expertise in leadership, nursing finance, evidence-based practice, and professional communication. Some courses require practical experience components. The program culminates in a one-semester practicum at an approved healthcare facility. Full-time students can earn the BSN online in four semesters. Students may not begin the program core before completing all general education and nursing cognate courses. Eligible students can expedite their studies by earning prior learning assessment credits for previous education and work experience. Students complete upper-division online courses sequentially; each course lasts either five and a half weeks, seven weeks, or a full semester. Students can begin the course sequence in the fall or spring. The nursing college uses a multi-layered ranking system to evaluate applicants. ECU's distance education programs are not available to students in all states. Distance learners are eligible for study abroad opportunities in Guatemala and can apply for need-based and merit-based scholarships. ECU's nursing college is a National League for Nursing Center of Excellence in Nursing Education. East Carolina University is regionally accredited by the Southern Association of Colleges and Schools Commission on Colleges (SACS). The nursing program is accredited by the Commission on Collegiate Nursing Education. University of Memphis ranks #9 on The 50 Best Online Bachelor's in Nursing Programs! UofM offers an RN to BSN program for nurses who want to earn their BSN quickly. The online accelerated BSN program admits RNs who hold two-year nursing degrees and have completed general education and nursing cognate prerequisites. Full-time students can complete the 31-hour, upper-division curriculum in one year, although students may take up to four years to graduate. Students earning the BSN online gain professional nursing skills and explore the changes in their professional roles as they transition from RNs into BSNs. Students become proficient in health assessments, pathophysiology, pharmacology, community health nursing, and evidence-based nursing practice. The program culminates in a practicum at an approved healthcare facility in the student's community. UofM offers start dates in the summer and fall. Distance learners study asynchronously and follow a semester-based class schedule. UofM is a military-friendly school and offers grant and scholarship funds for veterans and their family members. The university awards experiential learning credits for military training. Online students have access to academic advising, online tutoring, a digital library with a dedicated support stuff, and career planning. The University of Memphis is regionally accredited by the Southern Association of Colleges and Schools Commission on Colleges (SACS). The nursing program is accredited by the Commission on Collegiate Nursing Education. University of Arkansas at Little Rock ranks #10 on The 50 Best Online Bachelor's in Nursing Programs! The U of A offers an online accelerated BSN program for working nurses with diplomas or associate degrees. Students in the RN to BSN program build on foundational knowledge and nursing experience. Full-time students who meet all general education and nursing cognate prerequisites can complete the program in one year, and part-time students typically require five semesters. After completing prerequisites, students begin the 29-hour, upper-division curriculum. Courses focus on professional caregiving within specific patient populations; students learn to care for adult, mental and behavioral health, child and family, and critical care patients. After completing the program core, students receive 37 hours for prior academic and clinical experience. The U of A delivers all online courses asynchronously, and the program culminates in a practicum at an approved local healthcare facility. Applicants must hold licensure and/or a degree from an accredited nursing program, must have a 2.8 GPA, and must have completed at least 1,000 hours of clinical experience within the previous two years. Applicants without clinical experience hours may challenge the requirement with a clinical proficiency exam. The U of A delivers distance education courses in eight-week blocks and offers start dates in the fall and spring. University of Arkansas is regionally accredited by the Higher Learning Commission (HLC). The nursing program is accredited by the Commission on Collegiate Nursing Education. University of Massachusetts - Amherst ranks #11 on The 50 Best Online Bachelor's in Nursing Programs! The flagship campus in the University of Massachusetts network, the University of Massachusetts Amherst offers an RN to BS program that allows registered nurses to earn their four-year degree while they continue to deliver care to patients and their families. One of the top online BSN programs in the country, the degree weds coursework with practical, hands-on learning. The program requires 120 credits, 60 of which students must complete before starting the program. Students may receive 30 credits for their RN licensure. All learners must complete a capstone project at the end of the program. Classes include nursing informatics, gerontology, and nursing research. Students can start the program in either the spring or summer and complete it in just one year. Online learners can participate in the on-campus graduation ceremony and celebration activities once they fulfill degree requirements. Online learning is a highly interactive experience that allows students to engage with professors and classmates. All online students can access the university's library and research holdings. The cost of online studies is the same for all students regardless of where they live. UMass Amherst is not currently accepting applications from residents of Alabama and Arkansas. UMass Amherst is regionally accredited by the Commission on Institutions of Higher Education (CIHE) of the New England Association of Schools and Colleges (NEASC). University of Wisconsin - Madison ranks #12 on The 50 Best Online Bachelor's in Nursing Programs! Registered nurses who want to continue working full-time while pursuing their educational goals may consider an education from the University of Wisconsin. The BSN@Home program remains a consistent top choice for those who earned either an associate degree or nursing diploma with at least a 2.5 cumulative GPA. Nursing classes examine subjects like chronic care management, health technology, and gerontology. Students also enroll in science classes such as pathophysiology and clinical pharmacology. Students usually finish the degree in two to two and a half years. Learners must complete 124 credits to graduate, including at least 31 credits at UW. Students may transfer credits they previously earned through either an associate degree or a nursing diploma. The university grants 30 credits to Wisconsin Technical College System graduates and 24 credits to all others. Most RN to BSN students enroll with an average 3.4 GPA in previous coursework. However, UW will consider students with at least a 2.5 GPA. The program begins in the fall and spring terms. Tuition is the same for all students whether or not they reside in Wisconsin. The School of Nursing also awards more than $400,000 in scholarships annually to students who demonstrate academic performance and financial need. UW is regionally accredited by the Higher Learning Commission (HLC). University of Massachusetts - Lowell ranks #13 on The 50 Best Online Bachelor's in Nursing Programs! The University of Massachusetts Lowell delivers a flexible and affordable RN to BSN program for part-time nursing students. The program was designed for those who already possess experience in the field. The degree builds on students' previous academic training, exposing them to studies in community nursing, health promotion, and health assessment. In total, students must earn 120 credits to satisfy graduation requirements. Enrollees can receive 30 credits upon matriculation if they possess a current license. Students with a license may not have to take classes such as human anatomy, microbiology, college writing, and sociology. Students in the BSN online degree must complete certain classes at UMass Lowell. For example, the university requires an academic strategies portfolio seminar in which students set goals, manage time, perform literature searches, and cite reference materials. In addition, all learners must complete a research course in nursing and healthcare. Applicants must have completed prior coursework with at least a 2.7 GPA. All potential students must hold a nursing license. Learners may transfer up to 60 credits from another institution. Once enrolled in the program, students must maintain at least a 2.0 GPA. UMass Lowell is regionally accredited by the New England Association of Schools and Colleges (NEASC). Michigan State University ranks #14 on The 50 Best Online Bachelor's in Nursing Programs! Michigan State University offers part-time study options to accommodate the busy schedules of registered nurses. Flexible and affordable, the five-semester RN to BSN program is offered fully online. Students receive instruction from an expert faculty and skilled preceptors at partner clinical sites. Coursework includes pathophysiology, health promotion, and community health nursing. Nurses who hold an RN license receive 30 transfer credits. Most students enroll in six to eight credits each semester for five semesters. Students must complete clinical experiences in leadership immersion and community health at a site convenient to where they live. Applicants should have a cumulative GPA of at least 2.75 in all previously completed coursework. Prerequisite classes include social science, humanities, writing, chemistry, anatomy, and microbiology. Applicants should have earned a grade of at least a 2.0 in prerequisite science classes. Potential students must submit references, a resume, and an essay. MSU College of Nursing Scholarships are open to all learners who meet eligibility guidelines and maintain good academic standing. The university automatically considers new applicants for scholarships. Criteria include academic merit, leadership talent, and financial need. MSU is regionally accredited by the Higher Learning Commission (HLC). Pennsylvania College of Health Sciences ranks #15 on The 50 Best Online Bachelor's in Nursing Programs! Students enrolled in the RN to BSN program at Pennsylvania College of Health Sciences can advance both their knowledge and career in less than two years. This fully online program allows registered nurses to remain active in their work while building skills and deepening their understanding of the field. Students must complete 120 credits to satisfy degree requirements. Of these, 65 credits are lower-division credits that students can earn from an associate degree or nursing diploma and their nursing license. Students take 55 credits in classes such as human diversity and healthcare, American healthcare system, and ethical issues in healthcare. Expert faculty offer individualized attention to learners. For admission, students should have either an associate degree or nursing diploma with at least a 2.0 GPA. Furthermore, the school expects students to continue to work throughout their academic program. Students must work a minimum of eight hours per week in a healthcare setting. The college regularly hosts open house events for those interested in applying for admission. PA College is regionally accredited by the Middle States Commission on Higher Education (MSCHE). University of North Dakota ranks #16 on The 50 Best Online Bachelor's in Nursing Programs! The University of North Dakota delivers a fully online RN to BSN program for registered nurses who wish to better support patients and advance their career. This top-ranked online BSN degree builds on the education students previously acquired through their studies and professional experience. A combination of coursework and hands-on learning provides enrollees a complete education that weds nursing and general education subject matter. The program also ensures competence in patient advocacy, health restoration, and serving vulnerable populations. Learners must complete a minimum of 30 credits at the university. Classes cover topics such as aging, pharmacology, and health and illness. Students may choose to enroll on a part-time or full-time basis. Lectures may be live or previously recorded. In addition to coursework, students must complete clinical hours. These hours allow students to apply theories to real-world situations in a public health setting. Students may complete the clinical experience in a facility near where they reside. The university provides guidance on selecting an appropriate site. All students pay in-state tuition regardless of state residency. Students who successfully complete two semesters of online courses may apply for the Ben & Ruth Gustafson Continuing Education Endowment, which provides financial support for distance learning students. UND is regionally accredited by the Higher Learning Commission (HLC). Keiser University - Ft Lauderdale ranks #17 on The 50 Best Online Bachelor's in Nursing Programs! Keiser University's RN to BSN program is a degree completion program for those who already hold a nursing license. This program focuses strengthening students' critical thinking and communication skills. Students also collaborate with colleagues, assume leadership roles, and conduct research relevant to the profession. Students must complete prerequisite classes in topics like human anatomy, math, and microbiology before they pursue advanced coursework in nursing. Students then earn 60 credits in nursing courses such as crisis intervention, physical assessment in healthcare, and public health management. Learners must earn at least a “C” in all major classes to successfully fulfill degree requirements. Additional courses include professional communication and research writing. Students can consult the university's financial aid department to learn how to apply for federal financial aid. In addition, Keiser offers scholarships to eligible students and informs learners about available private scholarships. Keiser is regionally accredited by the Southern Association of Colleges and Schools Commission on Colleges (SACSCOC). University of Delaware ranks #18 on The 50 Best Online Bachelor's in Nursing Programs! Degree completion requires 120 credits, 30 of which students may earn from an associate degree or a nursing diploma. Students may also transfer in 50 general education credits from previous college work. The remaining 30 credits must be completed at UD Nursing. Students also undergo an 84-hour practicum. To accommodate students' busy schedules, the university offers year-round classes. Online learners enjoy access to all of the school's resources, including an online library. The university accepts applications on a rolling basis. Applicants submit three short essays. There is no application fee. An academic advisor will contact new students to create a customized curriculum. UD is regionally accredited by the Middle States Commission on Higher Education (MSCHE). University of Saint Francis ranks #19 on The 50 Best Online Bachelor's in Nursing Programs! The online accelerated BSN program at the University of St. Francis affords working students the opportunity to complete their bachelor's degree online. The university's rigorous curriculum, high-quality instruction, and stellar faculty prepare learners for successful careers in nursing, especially given the shortage of nursing professionals in the United States. Students engage in coursework that strengthens their critical thinking and analytical abilities in addition to their nursing competencies. Acceptance to this online BSN program requires previous completion of either an associate degree in nursing or a nursing certificate. Students should also hold licensure as a registered nurse. Courses include health policy and informatics in nursing. All classes are eight weeks long, which allows learners to complete their degree at an accelerated pace. Students receive one-on-one advising from expert faculty throughout their studies. Learners also engage in clinicals. Graduates can pursue careers in hospitals, hospices, public health institutions, and home health environments. Students who earn their associate degree at Joliet Junior College can transfer seamlessly to this four-year program. This bridge program ensures students do not unnecessarily repeat subject matter. JJC graduates also receive discounted tuition. The University of St. Francis is regionally accredited by The Higher Learning Commission. The baccalaureate and master's nursing programs are accredited by the Commission on Collegiate Nursing Education. Ball State University ranks #20 on The 50 Best Online Bachelor's in Nursing Programs! A highly reputable institution, Ball State University has been named a Center of Excellence by the National League for Nursing. The school's online RN to BS program is available in a fully online, asynchronous format. Students can complete the 120-credit program in six semesters on a part-time basis or three semesters on a full-time basis. Coursework prepares students to meet the complex health needs of the community. Learners must complete 180 clinical hours to put their lessons into practice. Graduates may find positions as a staff nurse, nurse trainer, nurse consultant, and RN case manager. Applicants should hold a current nursing license and a diploma from a nursing program accredited by the National League for Nursing Accrediting Commission. In addition, applicants must have at least a 2.75 GPA. Students who do not meet the minimum GPA requirement must earn at least a 2.75 GPA by the time they complete 16 credits at Ball State. Courses begin in fall, spring, and summer. BSU is regionally accredited by the Higher Learning Commission (HLC). Old Dominion University ranks among The 50 Best Online Bachelor's in Nursing Programs! Old Dominion University's RN to BSN program allows learners to complete their degree in two years of part-time study. As a result, nurses can continue to work full-time while they pursue their education. The program builds on lessons students learned in their associate studies. Classes examine topics such as health assessment, community health nursing, and nursing informatics. In total, students must earn 120 credits to graduate, with most of the credits fulfilled through either an associate degree or nursing diploma program. Classes begin in the fall and spring. The program is fully online and asynchronous, allowing students to watch lectures and complete coursework whenever is most convenient. Distance learners can access the university's library resources and student support services. ODU maintains agreements with several Virginia community colleges. Those who complete a two-year degree at a partner institution may easily transfer their credits to their ODU program. Interested students should submit a Letter of Intent to Transfer after completing at least 15 transferable credits and earning at least a 2.5 GPA. ODU connects all applicants with an enrollment coordinator. This coordinator provides expert guidance throughout the application process. ODU is regionally accredited by the Southern Association of Colleges and Schools Commission on Colleges (SACSCOC). Clarkson College ranks among The 50 Best Online Bachelor's in Nursing Programs! Full-time students in Clarkson College's RN to BSN program can graduate in just three semesters, making it an excellent choice for students who want to earn their degree quickly. The program attracts registered nurses seeking a customizable plan of study and a small student-to-faculty ratio. Students in the program must complete 28 credits. The school requires 12 credits in BSN courses such as evidence-based inquiry in healthcare and population health. Students must also complete service learning courses that exemplify Clarkson's commitment to caring, integrity, and commitment. Students in these classes connect civic service and practice. In addition to a current nursing license and prior education, all Clarkson RN to BSN applicants must submit a technical standards form. By completing the form, BSN students agree that they are able to meet certain communication, motor, observation, and cognitive competencies. Students must complete the Clarkson College Health Care Core curriculum as part of their studies; however, they may test out of general education courses through examinations. Moreover, nurses with at least two years of experience may submit a portfolio in lieu of completing one upper-level class. Clarkson is regionally accredited by the Higher Learning Commission (HLC). The BSN program is accredited by the Accreditation Commission for Education in Nursing (ACEN). Indiana Wesleyan University ranks among The 50 Best Online Bachelor's in Nursing Programs! Indiana Wesleyan University prides itself knowing its RN to BSN online program helps nurses improve their professional growth, earnings potential, and employability. The program is designed for students who prefer independent study and practical applications. New students join as part of a cohort of 20 students. Learners typically take 15 months to finish their degree. Some students may opt for a fast-track curriculum that lets them finish in a shorter period of time. The school accepts new students seven times per year. Required courses include health indicators and clinical prevention, leadership and management, ethics, and nursing from a Christian worldview. Most students enroll in one course at a time. Applicants must hold a nursing license and at least a 2.0 GPA in prior coursework. Students may transfer 60 credits if they previously earned an associate degree at a regionally accredited institution. Students with a nursing diploma from an accredited hospital school of nursing may transfer up to 40 credits. IWU may admit students who do not meet these requirements on a probationary basis. IWU is regionally accredited by the Higher Learning Commission (HLC). The BSN is accredited by the Commission on Collegiate Nursing Education. Drexel University ranks among The 50 Best Online Bachelor's in Nursing Programs! Located in Philadelphia, Pennsylvania, Drexel University offers more than 100 online degrees and certificate programs. The online RN to BSN program is flexible enough for students balancing school, family, and career. Distance learners are able to virtually work with patients through Drexel's Health Assessment Simulation Lab. The program's 10-week quarters allow students to complete more classes in a shorter amount of time. Learners must complete 180 quarter credits. They may transfer up to 135 quarter credits from previous coursework and licensure. The remaining 45 quarter credits are core BSN classes. Students in these courses examine topics such global health, aging and longevity, and genetics and genomics. A class in community health introduces students to population-focused practice through experiential learning in settings such as assisted living facilities, health departments, and clinics. All learners must also complete a senior capstone in nursing. Drexel provides special tuition plans for members of the American Nurse Association, health system partners, and community college employees. Applicants must have at least a 2.0 GPA. Drexel is regionally accredited by the Middle States Commission on Higher Education (MSCHE). The BSN and the MSN are accredited by the Commission on Collegiate Nursing Education (CCNE). University of Cincinnati ranks among The 50 Best Online Bachelor's in Nursing Programs! With a focus on altruism through knowledge, caring, and community service, the RN to BSN program at the University of Cincinnati prepares learners for a rewarding career in the healthcare field. The program strengthens students' critical thinking and problem-solving abilities, both of which are essential in this complex profession. Students undergo rigorous coursework and relevant hands-on experience. Full-time students can complete the program in nine months while part-time students usually finish the degree in 12 to 18 months. Learners must take nine nursing classes in order to graduate. Admitted students can receive credit for previous general education courses. Major nursing classes include topics in gerontology, community health, and informatics. The university maintains agreements with several community colleges in Ohio and Kentucky. Graduates of these two-year schools can seamlessly transfer to their four-year program. Students may apply for admission each semester. In addition to proof of their nursing license, applicants must submit official transcripts from all institutions they previously attended. Residents of Louisiana, Massachusetts, New York, Oregon, Tennessee, and Washington are ineligible for admission. US is regionally accredited by the Higher Learning Commission (HLC). University of North Carolina at Charlotte ranks among The 50 Best Online Bachelor's in Nursing Programs! The University of North Carolina at Charlotte offers an RN to BSN degree completion program that can be completed in one year. Students gain practical, hands-on experience in the field. Classes examine topics such as information technology in healthcare and issues in cultural health. Learners also study community health nursing to develop the competencies necessary to work closely with diverse populations of patients. This fully online program does not require students to spend any time on campus. New students may begin in the fall or spring. The university awards students 39 credits to registered nurses once they complete an introductory course in theories and ethics. All applicants to the RN to BSN program must have at least a 2.0 GPA in previous college coursework. Applicants must complete both a UNC Charlotte admissions application and a School of Nursing application. The university advises non-North Carolina residents to contact the nursing board in their state to determine if the program satisfies licensure requirements. Students who have not completed all general education or nursing prerequisites should apply for UNC Charlotte's pre-RN to BSN program. However, finishing the pre-BSN curriculum does not guarantee admission to the four-year program. The University of North Carolina at Charlotte is regionally accredited by the Southern Association of Colleges and Schools Commission on Colleges (SACSCOC). George Mason University ranks among The 50 Best Online Bachelor's in Nursing Programs! George Mason University offers a top-ranked online BSN program for registered nurses seeking convenience, value, and rigor in their continued studies. Designed to accommodate the busy schedule of working professionals, this RN to BSN program is delivered fully online with classes structured in in a seven-week format. Learners can graduate in as few as two semesters. The program requires 30 nursing major credits. Students must satisfy general education requirements; most students transfer these credits from their associate degree program. These prerequisites include courses like microbiology and statistics. Major nursing courses cover topics in epidemiology, vulnerable populations, and nursing informatics. GMU classes are project-based. In total, learners must earn 120 credits. GMU's career advisors help graduates find position in hospitals, schools, and nursing homes. Applicants must submit both GMU and BSN applications. Applicants also supply transcripts, a resume, and a non-refundable application fee. Potential students must have earned at least a C in all previous college-level coursework. Classes begin in the fall and spring. GMU is regionally accredited by the Commission on Colleges of the Southern Association of Colleges and Schools (SACSCOC). Pennsylvania State University-World Campus ranks among The 50 Best Online Bachelor's in Nursing Programs! One of the nation's leading public research institutions with a standout reputation, The Pennsylvania State University World Campus provides an education to nearly 18,000 distance learning students. Graduates from the online RN to BSN program are well prepared to meet the demands of the complex healthcare field. The degree deepens learners' critical thinking and problem solving abilities through coursework that examines research in family and community health, health assessment, forensic nursing, and data management. Students must earn a total of 120 credits, including credits earned during a previous associate program. Fully online and asynchronous. The program does not require any on-campus components, although learners who live locally can choose to take on-campus classes. All students must undergo clinical requirements so that they can gain professional experience. Distance learners who wish to complete their degree in a shorter period of time can choose to take courses in an accelerated format. Accelerated classes take just seven-and-a-half weeks to complete. Furthermore, students can enroll in accelerated classes while simultaneously completing standard, semester-long classes. Applicants must either complete an RN program or hold an active RN license in the U.S. The license must be in the state in which the student will ultimately complete their clinical requirements. Applicants must also submit all prior college transcripts. Penn State World Campus is regionally accredited by the Middle States Commission on Higher Education (MSCHE). Rowan University ranks among The 50 Best Online Bachelor's in Nursing Programs! Nursing students interested in pursuing graduate study may consider Rowan University's RN to BSN program. Students can easily segue to a master's degree program, especially since the curriculum includes six credits that are applicable to advanced studies. Completing the program requires 121 credits. The school grants 30 credits for licensure and up to 90 credits for previous college work. All courses are structured in seven-week and 14-week modules, with each week of study commencing on Tuesdays and ending on Mondays. General education classes explore topics in fine arts, literature, and public speaking. Nursing classes feature studies in pathophysiology, pharmacology, healthcare ethics, and health assessment. A research course builds students' skills in managing and interpreting data. In addition to a Rowan application, those who wish to enter this program must provide college transcripts, a resume, and list of courses in which they may be currently enrolled. Students must have earned at least a 2.5 GPA. In addition, applicants must either be licensed or be eligible for license in New Jersey. Classes begin in the fall, spring, and summer. Rowan is regionally accredited by the Middle States Commission on Higher Education (MSCHE). The University of Tennessee ranks among The 50 Best Online Bachelor's in Nursing Programs! The flagship campus for the University of Tennessee system, UT Knoxville offers flexible online programs to students across the U.S. The school's RN to BSN is a top choice for students who have earned either an associate degree or nursing diploma with at least 63 transferable credits. Students who enroll full-time can complete the entire degree in just 12 months. Learners in the program must complete 34 credits of major nursing courses. These classes examine subjects like global health perspectives, pharmacotherapeutics, and transcultural nursing. The course sequence is fixed, so those who begin studies out of sequence may require additional time to complete their degree. Students may complete the necessary clinical course requirement either virtually or in a local setting. In total, completing this program requires 123 credits. Students must complete at least 60 credits at the university in order to be eligible for honors designations. Classes are structured in an eight-week format. The university automatically awards 26 proficiency credits to students with an RN license. Any student who graduated from a Tennessee Board of Regents institution does not have to complete additional general education requirements. Graduates of other systems or students with a nursing diploma instead of an associate degree may have additional requirements to meet. New students may begin in spring or fall. UT is regionally accredited by the Southern Association of Colleges and Schools Commission on Colleges (SACSCOC). South Dakota State University ranks among The 50 Best Online Bachelor's in Nursing Programs! The RN to BSN program at South Dakota State University focuses on leadership, upward mobility, and a customizable curriculum. The degree builds on students' previous academic training, exposing them to studies in patient-centered care, family and communication, and nursing research. In total, students must earn 120 credits to satisfy graduation requirements. Learners must complete at least 30 credits at SDSU. Students can receive 90 credits upon matriculation if they possess a current license and an associate degree. Prerequisite courses include human anatomy, psychology, public health, and nutrition. They must maintain an overall 2.5 GPA and complete all nursing courses with at least a C.
In addition to an RN license, applicants must have completed prior coursework with at least a 2.5 GPA. They should also provide proof of personal liability insurance. Students who began a BSN program at another institution may transfer to SDSU if they submit a letter that explains the reason for their decision. Their application must also include three letters of recommendation, with one from the dean of their program and two from faculty members to verify good standing. SDSU is regionally accredited by the Higher Learning Commission (HLC). Western Carolina University ranks among The 50 Best Online Bachelor's in Nursing Programs! The RN to BSN program at Western Carolina University develops competencies in therapeutic communication, reasoning, and collaboration with other healthcare providers. Graduates from the program understand how to find and assess the information most critical to patient care. Classes are structured in four six-hour blocks, with three classes per block. Students must complete all three courses in a block together. The four blocks are introductory, leadership, research, and community health. The community health block includes the required practicums, which learners can complete in the community where they reside. Each practicum is 60 hours, 20 of which may be virtual. Potential students must submit applications to both WCU and its School of Nursing. WCU maintains an articulation agreement with community colleges in North Carolina and the University of North Carolina system. Students who complete their two-year degree at one of these institutions do not have to complete additional liberal arts coursework. Some North Carolina community colleges offer pathway programs that facilitate transition to a four-year program at WCU. WCU is regionally accredited by the Southern Association of Colleges and Schools Commission on Colleges (SACSCOC). The WCU School of Nursing is accredited by the Commission on Collegiate Nursing Education. Chatham University ranks among The 50 Best Online Bachelor's in Nursing Programs! Students enrolled in the RN to BSN program at Chatham University can earn a baccalaureate degree in as few as two semesters. Distance learners receive individualized attention from expert faculty. Notable classes include health policy and finance, clinical prevention, women's health, and geriatrics. Students must complete 120 credits to satisfy degree requirements. Of these, 26 credits are specific to the RN to BSN program. Learners can transfer in up to 90 credits from their previous studies. The program also mandates 140 practical hours in a clinical environment. Some students may choose to minor in a complementary discipline like business or psychology. Doing so requires an additional 18 credits as well as consultation with an academic advisor. Applicants must have earned at least a 2.0 GPA from their associate degree or nursing diploma. Potential students should submit an official transcript and a copy of their current RN license. Chatham maintains an articulation agreement with some local community colleges to facilitate transition from two-year to four-year institutions. Chatham University is regionally accredited by the Middle States Commission on Higher Education (MSCHE). Villanova University ranks among The 50 Best Online Bachelor's in Nursing Programs! The M. Louise Fitzpatrick College of Nursing at Villanova University delivers a fully online RN to BSN program for registered nurses who wish to strengthen their knowledge of the field. Students gain competencies in patient advocacy, health restoration, and serving vulnerable populations. Classes include nutrition, public health, and clinical decision making. The National League for Nursing has designated Villanova's College of Nursing a Center of Excellence in Nursing Education. Learners must complete a 60 RN to BSN credits, all of which they can complete fully online. Students can watch lectures and access video-based classrooms anytime. In addition to coursework, students must complete clinical hours through a practicum in health promotion and home health. This experience requires engaging in evidence-based care in community settings. Clinical students also learn how to provide interventions that help improve populations' well-being. A field work course allows learners to demonstrate skills in management and organizational processes in nursing. Tuition is the same for all students regardless of the state in which they live. Some distance learners may be eligible for scholarships. For admission, the school reviews factors such as high school performance, college GPA, standardized test scores, application essays, extracurricular activities, and teacher recommendation. Villanova is regionally accredited by the Middle States Commission on Higher Education (MSCHE). University of Southern Mississippi ranks among The 50 Best Online Bachelor's in Nursing Programs! The University of Southern Mississippi's RN to BSN program is designed for nurses who plan on working full-time while pursuing higher education. Students can complete their degree in just three semesters with eight-week, 10-week, and 16-week class options. All courses and prerequisites are available fully online. Courses examine medical-surgical nursing, maternal-child nursing, and psychiatric nursing. Additional courses include statistics and microbiology. Learners must fulfill general education classes in subjects like natural science and written composition before they pursue advanced coursework in nursing. However, many students have already met most, if not all, of these requirements in their associate program. Students may also 34 credits for previous nursing coursework. The nursing degree requires 66 credits of major coursework. Tuition is the same for all online degree seekers. The Mississippi Institutions of Higher Learning and the university's School of Nursing offer several scholarships each year. Missouri State University ranks among The 50 Best Online Bachelor's in Nursing Programs! Missouri State University - Springfield offers a fully online RN to BSN program for registered nurses who want to complete a four-year degree. This online BSN builds knowledge in the nursing field while ensuring students possess the competencies necessary for career advancement and success. Graduates pursue positions as travel nurses, school nurses, and military nurses. They may work in acute care and public health facilities. The program requires 125 credits. This includes 47-51 credits in general education classes, 30 credits in nursing fundamentals, and 31 credits in advanced nursing studies. In addition, students must complete six credits in related electives. Major course requirements include human pathophysiology and healthcare legal issues. Learners must complete their degree within five years. The university recommended six to eight credits each semester at the maximum for those who continue to work while pursuing their degree. Students must receive admission prior to earning 75 credits. Applicants should have at least a 2.75 GPA in 30 credits of college coursework. Applicants should also provide proof of health insurance and current immunization. Classes begin in the fall, spring, and summer. Successful completion of this degree requires at least a 2.5 cumulative GPA. Mount Carmel College of Nursing ranks among The 50 Best Online Bachelor's in Nursing Programs! Located in Columbus, Ohio, Mount Carmel College of Nursing boasts one of the best online nursing programs in the state. Its online RN-BSN completion program combines Mount Carmel's century of experience educating nurses with the latest advancements in online education. Students in this online BSN program complete 30 synchronous credits of nursing courses and 14 credits of general education courses. In the nursing curriculum, students receive specialized training in gerontology, community nursing, and the latest evidence-based practices. Due to Mount Carmel's Catholic roots, general education courses introduce students to ethical issues in nursing and the role of religion and spirituality in the profession. Transfer applicants can apply previously earned credit to fulfill both general education and nursing requirements. Full-time students may finish the program in as few as 16 months, whereas part-time learners can expect to earn their degrees in seven semesters. To apply, potential students should hold at least 84 credits from an associate program with a minimum 2.0 GPA and have an active nursing license. Mount Carmel does not require applicants to submit exam scores. Once accepted, students can begin their program in the summer, fall, or spring terms. All coursework can be completed online and distance learners never have to visit the Columbus campus. All students, no matter their state of residence, pay the same tuition. Mount Carmel College of Nursing is regionally accredited by The Higher Learning Commission. Nebraska Methodist College of Nursing & Allied Health ranks among The 50 Best Online Bachelor's in Nursing Programs! Nebraska Methodist College of Nursing & Allied Health educates future nurses at its Omaha campus and nationally through its online programs. Distance learners enrolled in the RN to BSN program complete a curriculum focused on community health. Full-time students can earn their degree in seven semesters. Full-time and part-time students complete a synchronous BSN online curriculum that stresses nursing fundamentals while also incorporating elective courses that allow students to personalize their educations. The program also boasts two optional minors: Spanish for healthcare professionals and healthcare sign language. Students in their last semester complete a capstone project where they research how nurses act as both healthcare professionals and responsible citizens. The program requires students to earn 77 credits, although this number may be higher if students elect to complete a minor. Most courses last five weeks with a week off between sessions. When applying, prospective students indicate whether they want to begin the program in the spring, summer, or fall. Applicants must hold an active nursing license and an associate degree with a GPA of 2.5 or higher. Admissions counselors review transfer credits on a case-by-case basis and help connect students to internal and external scholarship opportunities. Once accepted, all learners pay the same tuition, no matter their state of residence. Additionally, Methodist Health System employees receive tuition assistance. Nebraska Methodist College of Nursing & Allied Health is regionally accredited by the Higher Learning Commission. University of North Carolina Wilmington ranks among The 50 Best Online Bachelor's in Nursing Programs! For over four decades, the University of North Carolina Wilmington has delivered top-rate educational experiences to nurses. In recent years, the university extended its reach through online education programming. Students enrolled in the school's RN to BSN online program can earn their bachelor's in nursing in just one year. Full-time students in this BSN online program complete 31 credits over the course of six, seven-week terms. Curriculum highlights include a class in transcultural healthcare where students learn to interact with patients from different cultures and socioeconomic backgrounds. Once a course begins, students can view lectures at their own pace, but they must adhere to their professor's schedule when completing academic work. At the end of the program, students undertake a capstone experience that involves synthesizing information from previous courses and keeping a detailed record of their professional development. The university offers rolling admissions throughout the year. Prospective students must have earned a minimum 2.5 GPA during their associate degree program. Other application requirements include having earned a 'C' or higher in all previous nursing courses and an active nursing license. The university considers transfer credits on a case-by-case basis. University counselors help new students fill out the FAFSA to determine whether they qualify for federal financial aid. The University of North Carolina Wilmington is regionally accredited by the Southern Association of Colleges and Schools. Minot State University ranks among The 50 Best Online Bachelor's in Nursing Programs! In addition to courses taught at its North Dakota campus, Minot State University offers online programs that educate thousands of undergraduate and graduate students around the U.S. In the school's BSN completion program, registered nurses with an associate degree can earn their bachelor's in nursing in two years. The program uses the Blackboard learning management system to deliver online coursework, allowing students to interact in real-time with their professors and peers. Students may transfer up to 60 credits from their associate program towards this online BSN degree. During the program, students complete 23 credits related to their major and 38 general education credits. The program involves a mix of synchronous and asynchronous courses, and some classes require students to complete clinicals at their place of employment. Graduates also learn how to effectively communicate and apply critical thinking skills in the workplace. To apply, prospective students must hold an active nursing license and an associate degree with a 2.75 GPA or higher. Applicants who have not yet passed the NCLEX-RN can still apply to the program after completing all general education courses. Once accepted, students can begin the program in the spring or fall. Both in-state and out-of-state students pay the same tuition. The school also provides its learners with dozens of financial aid resources. Minot State University is regionally accredited by the North Central Association of Colleges and Schools. 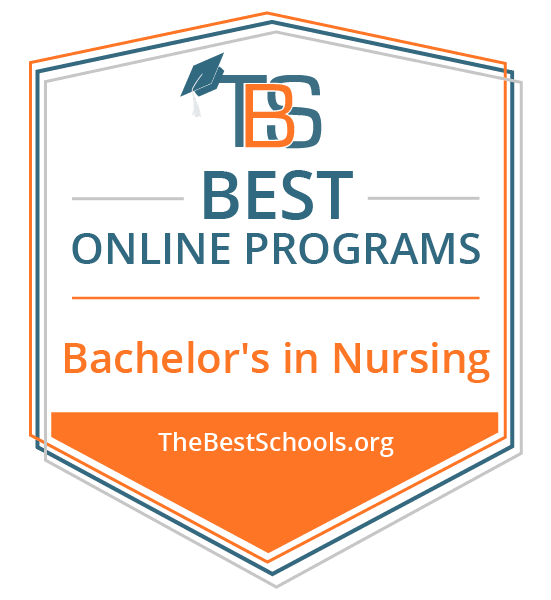 Georgia Southern University ranks among The 50 Best Online Bachelor's in Nursing Programs! Georgia Southern University has educated students at its Statesboro-based campus for over a century. Today, the university also hosts over two dozen undergraduate and graduate degree programs entirely online. The school's online RN-BSN program appeals to registered nurses looking to advance their careers quickly; full-time students can earn their degree in three semesters. Students enrolled in this online BSN program complete a total of 28 credits. The curriculum stresses nursing leadership and clinical experiences that students typically complete on the job. The program includes a mix of synchronous and asynchronous courses, and the university posts all synchronous course times and dates well in advance so that students can adjust their schedules accordingly. To remain in the program, students must earn a 'C' or higher in all nursing courses. Graduates learn to apply the latest nursing best practices in the workplace and develop positive partnerships to improve patient health. Prospective students must have earned a 3.0 GPA or higher during their associate degree program. Other application requirements include a valid Georgia nursing license and having completed required core courses. Students with a pending license or pending NCLEX-RN scores may still apply. Once accepted, all students pay the same tuition, no matter their state of residence. Georgia Southern University is regionally accredited by the Southern Association of Colleges and Schools. University of West Florida ranks among The 50 Best Online Bachelor's in Nursing Programs! Based in Pensacola, the University of West Florida offers 723 online courses to more than 4,000 students living in Florida and around the world. The university's online campus provides 24/7 technical support and all coursework will be available on the Canvas learning management system by Fall 2018. The fully online RN to BSN program allows registered nurses to earn their bachelor's degree in just two years. The core of the BSN online program consists of 12 nursing courses, comprising a total of 32 credits. The curriculum stresses academic writing and community nursing, two in-demand skills sought by hospitals and other medical centers. Distances learners must take some of their nursing courses synchronously. Additionally, enrollees complete at least 16 upper-division elective credits; many of these classes can be fulfilled asynchronously. Individuals typically complete all clinical requirements at the medical center where they work as a registered nurse. Applicants must have earned a 'C' or higher in all nursing courses in their associate program, in addition to posting an overall GPA of 2.75 or higher. Other requirements include holding a nursing license in the applicant's state of residence. The university requests that potential students determine whether their home states and Florida have a reciprocal license agreement before they decide to apply. Although out-of-state students typically pay higher tuition than Florida residents, the university provides out-of-state tuition waivers on a case-by-case basis. The University of West Florida is regionally accredited by the Southern Association of Colleges and Schools. Liberty University ranks among The 50 Best Online Bachelor's in Nursing Programs! From its campus in Lynchburg, Virginia, Liberty University offers dozens of online degree programs from the associate to doctoral level. In its RN to BSN online program, students complete coursework through the Blackboard learning management system to earn their degrees in 18 months. As an evangelical Christian school, Liberty's mission is to teach its students how to impact their culture as a champion for Christ. Students enrolled in this online BSN program must earn a minimum of 30 credits at Liberty. However, individuals may apply up to 90 credits from their associate program toward their bachelor's degree. Students with fewer than 90 transferable credits may need up to 2.5 years to complete their degrees. Distance learners complete a variety of synchronous classes, including pathophysiology and population health. Students have the option to complete their education entirely online or in a hybrid format where they take some accelerated coursework at the Lynchburg campus. To remain in good standing, students must earn a 'C' or higher in all of their nursing courses. Prospective students can apply to the program at any time and begin the program in the spring, summer, or fall. Applicants must hold an active nursing license in their state of residence and have earned a minimum 2.0 GPA during their associate program. Students with an associate degree automatically earn 31 credit hours towards their bachelor's. All students pay the same tuition, no matter their state of residence. However, part-time students pay higher tuition than full-time students. Nova Southeastern University ranks among The 50 Best Online Bachelor's in Nursing Programs! Nova Southeastern University, located just west of Fort Lauderdale in Florida, has been a leader in health education for more than 50 years. Over that time, the university established multiple medical colleges that award degrees to pharmacists, dentists, optometrists, and nurses. In the school's online RN to BSN program, students can earn their bachelor's in nursing in four semesters. Students can begin their BSN online program in the fall, winter, or summer. Core BSN courses, taken synchronously, consist of 36 credits. Curriculum highlights include healthcare ethics and the business of healthcare, the latter of which trains nurses about how the Affordable Care Act affects the nursing profession. Some classes require students to complete practicum experiences in their communities. Undertaking a practicum helps students achieve one of NSU's many program outcomes: collaborating with the greater health community to provide the best patient care. Applicants must hold an active nursing license in their home state, although NSU has no minimum GPA requirements in prior undergraduate coursework. Accepted students who have yet to complete specific general education requirements must do so before officially matriculating into the RN to BSN program. NSU also works closely with veterans to offer financial and academic resources to students transferring from military to civilian life. All distance learners pay the same tuition, no matter their state of residence. Nova Southeastern University is regionally accredited by the Southern Association of Colleges and Schools. Webster University ranks among The 50 Best Online Bachelor's in Nursing Programs! Webster University designed its online BSN program with part-time students in mind, allowing working registered nurses to attend classes while juggling personal and professional obligations. For students living in the St. Louis, Missouri area, learners also have the option to study in a hybrid format that features on-campus evening classes. Full-time students can complete the program in two years. Webster's online BSN program centers on 30 credits of nursing classes. The curriculum stresses both nursing fundamentals and interprofessional collaboration and leadership. Coursework includes classes in lifespan health assessment and population health. Some classes feature a clinical component, which students typically complete at their job site. Students must pass all nursing courses with a 'C' or higher and successfully complete a practicum experience. If students need to take additional courses to fulfill bachelor's degree requirements, Webster also offers these courses online. Additionally, the program has an optional global citizenship concentration. All applicants must hold an active nursing license or be prepared to pass the NCLEX-RN within three months of acceptance into the program. Students must also have a minimum 2.5 GPA in all previous undergraduate coursework. All prospective students must interview with a faculty member. Webster University is regionally accredited by the Higher Learning Commission. University of Hawaii at Manoa ranks among The 50 Best Online Bachelor's in Nursing Programs! The University of Hawaii at Manoa provides dozens of online degrees to students. Through the school's RN to BS program, individuals can complete their bachelor's degree in three semesters. Coursework may be completed entirely online, face-to-face, or through the Hawaii Interactive Television Service. The university designed this online BSN program for nurses with fewer than two years of professional experience. Specialized courses introduce relatively inexperienced nurses to a variety of important topics, such as community health and genetics in nursing practice. A unique feature of the synchronous curriculum includes a focus on nursing best practices when working with Hawaii's many ethnic groups. Graduates develop culturally appropriate clinical knowledge by examining, processing, and disseminating knowledge to improve and maintain the health of a diverse society. All learners in the program gain access to individual academic advising and support throughout the program. Applicants must hold an associate degree earned with a minimum 2.5 GPA. The program accepts new students only for the fall semester. Before entering the program, students must complete 44 hours of prerequisite courses. Most learners fulfill these requirements by transferring credit earned during their associate program. Students without an adequate number of transfer credits can also take these prerequisite courses online through the university. The University of Hawaii at Manoa is regionally accredited by the Western Association of Schools and Colleges. Western Kentucky University ranks among The 50 Best Online Bachelor's in Nursing Programs! Since its launch in 1998, Western Kentucky University's online programming has offered students more than 50 online degree options from the associate to doctoral level. WKU's commitment to distance education allows students living far from its Bowling Green campus to advance their educations and careers. In the school's RN to BSN program, full-time students can earn their degrees in three semesters, while part-time students can graduate in five semesters. Distance learners who hold an associate degree complete 39 synchronous hours of core nursing courses. Curriculum highlights include transcultural nursing, pharmacology, and nursing leadership. Students complete clinical hours in their home communities, usually at their job site. Distance learners who have yet to earn an associate degree must also complete 39 hours of general education courses. Additionally, individuals living near campus can opt to take courses in a hybrid format. Applicants must have earned a GPA of 2.5 or higher in all previous undergraduate coursework, but WKU does not require applicants to have an active nursing license. Once accepted, all students pay the same tuition, regardless of their state of residency. Enrollees have the option to begin the program in the spring or fall. Work experience as a registered nurse may be used to fulfill the academic requirements for up to three courses. Western Kentucky University is regionally accredited by the Southern Association of Colleges and Schools. Fort Hays State University ranks among The 50 Best Online Bachelor's in Nursing Programs! Fort Hays State University's virtual college allows thousands of students living outside of the Hays, Kansas area to advance their educations. FHSU offers more than 50 online degrees from the associate to master's level. Registered nurses looking to complete their bachelor's in nursing can graduate from the school's online RN to BSN program in just three semesters. In January 2018, FHSU launched a new BSN online program comprised of 10 synchronous core courses. This 30-credit curriculum stresses healthcare ethics and a capstone practicum that requires students to complete specialized work in their home communities. To remain in the program, students must earn a 'C' or higher in all courses. Distance learners who need to complete coursework beyond the required 30 credits to meet bachelor's degree requirements may do so through FHSU's general education program; the entirety of this program is available online. Applicants can apply to begin classes in the spring, summer, or fall. Prospective students must have earned a minimum 2.5 GPA in all previous undergraduate coursework and hold an active nursing license. Online students who are Kansas residents save approximately 25% on tuition compared to out-of-state students, and students who study full-time pay less per credit than part-time learners. FHSU's support staff helps connect nursing students to multiple scholarship opportunities. Fort Hays State University is regionally accredited by the Higher Learning Commission. Roberts Wesleyan College ranks among The 50 Best Online Bachelor's in Nursing Programs! Students living outside of western New York can take advantage of Roberts Wesleyan's online offerings to pursue several degree programs. The college uses a cohort model, allowing online students to develop close relationships with their classmates. Both in-state and out-of-state online students pay reduced tuition relative to their on-campus peers. In Roberts' RN to BS program, students can complete their bachelor's degrees in just 15 months. Previous graduates have gone on to work at some of the largest healthcare employers in the U.S. The core online BSN curriculum consists of 36 credits taken asynchronously. Curriculum highlights include courses in career development and healthcare management. All classes forgo tests, awarding grades solely based on the quality of students' projects, papers, and presentations. The program also requires students to complete a practicum project in their local communities. Students have the option of fulfilling some core credit requirements based on professional training or military experience. Applicants must hold either an associate degree in nursing or have earned at least 60 semester credits from an accredited college or university. Roberts also requires all applicants to work as registered nurses for at least 20 hours per week while pursuing their degrees. Once accepted, students may begin the program in the spring, summer, or fall. All students pay the same semester-based tuition, no matter their state of residence. Roberts Wesleyan College is regionally accredited by the Middle States Commission on Higher Education. Misericordia University ranks among The 50 Best Online Bachelor's in Nursing Programs! Registered nurses seeking to advance their careers and earn a bachelor's degree may be interested in attending Misericordia University. Whether at the Dallas, Pennsylvania campus or online, students can enroll in the school's expressway RN to BSN program. In this program, academic counselors review distance learners' transcripts to tailor custom academic plans for each nursing student. The online BSN program's academic foundation rests on nine synchronous courses. The 25-credit curriculum stresses pharmacology, informatics, and the latest trends in the nursing field. All nursing students must also pass a statistics course. The university boasts a specialization in nursing leadership, which may appeal to nurses who already hold a bachelor's degree in an unrelated field. For students who need to earn more than the 25 core credits to meet bachelor's degree requirements, the university offers additional online classes. Students may also use a combination of subject exams and prior learning assessments to fulfill these requirements. To apply, prospective students must hold a valid nursing license and be working as a registered nurse. The university also requires applicants to have earned a minimum 2.75 GPA in all undergraduate coursework. Students may begin the program in the fall, spring, or summer. Individuals who join the expressway program save approximately 25% on tuition compared to other online students. The university also has scholarships that help select female students in the second half of their nursing programs. Misericordia University is regionally accredited by the Middle States Commission on Higher Education. After you gain on-the-job experience in nursing, you have the option to broaden your career through further education. The careers below represent a few career options available to you within nursing. Registered Nurse: Registered nurses are the backbone of the nursing profession. They assess patients' symptoms and observe their progress. Working alongside physicians, registered nurses discuss care with patients and their families and help identify diagnoses. Outside of the hospital setting, registered nurses work in a variety of locations, including schools and offices. Nurse Practitioner: Through earning a master's in nursing, a registered nurse can become a nurse practitioner. Nurse practitioners can diagnose illnesses and prescribe medication, making them a valuable resource in rural settings with few hospitals or other medical offices. In hospitals, nurse practitioners often lead teams of registered nurses. Physical Therapist: Physical therapists work alongside patients to help them recover from injury or illness. They instruct patients on exercises meant to increase strength and mobility. Nurses with experience in physical therapy can readily transition between nursing and physical therapy positions.